✅Fast Charging: With a quick QC 3.0 port, it enables you to get a quick top off on your QC 3.0-enabled mobile phones. The other dual USB ports support AIPowerport smart charging which can automatically identify the type of your devices to offer high charging efficiency ( Their total output can be up to 2.4A). ✅LED Display Screen: It features a LED digital screen which clearly shows the voltage and current in real time. ✅3 USB Ports:It comes with three optional USB port which allows you to three devices simultaneously at a amazingly fast speed. You are able to charge you smart phones, tablets, and other devices at the same time. ✅Multiple protection: The built-in intelligent chip offers strong protection against overheating, over-current,over-voltage and short-circuit.The 5V 2.4A synchronous rectifier also enable you to charge it safely. 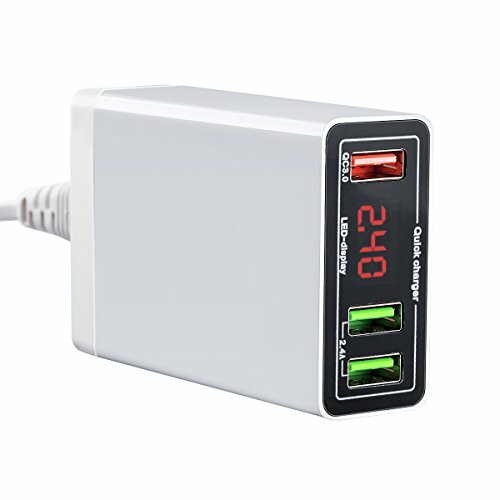 ✅Universal Compatibility: This 3-port USB charger is compatible for almost all 5V devices,such as smart phones(iPhone and android phones),power banks,mp3 players, tablets,PSP and other electronic devices.